In the category ‘Creative Use of the Environment,’ the judges were looking for the best use of the available indoor and/or outdoor space to increase patients’ levels of physical activity to improve their mobility, flexibility and wellbeing. They were also looking for evidence of how the use of space has encouraged the use of all motor skills, improved endurance and strength, reduced stress levels and promoted relaxation. The awards were presented at a glittering black-tie event at Titanic Belfast on 14 March 2019. 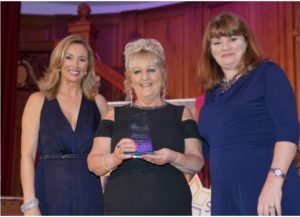 The awards evening was compered by broadcaster Claire McCollum and Patricia McMullan, the General Manager of Nazareth House Care Village was presented the award by Fiona McAnespie from Radius Housing. Overall it was a very successful night for Nazareth House Care Village who were runners up in five other categories including Nursing Home of the Year. The Staff Nursing Care Awards set out to reward good practice and to celebrate achievements. The awards recognise innovation and outstanding clinical excellence in healthcare professionals in care homes, residential care settings and domiciliary care teams across Northern Ireland.